Heat pumps are one of the most efficient methods of heating and cooling your home. They are quiet and come in a range of models with different amounts of output and features. They are discreet to fit into almost any home. Most heat pump units are programmable with a range of options such as timed on/off, eco modes, and/or other options. Some even have the option of connect via your smartphone – great for emergencies or simple convenience. Why Choose A Daikin Heat Pump? Daikin is the world’s number one air conditioning company. They are renowned for their reliability, efficiency, and quality service providers. All Daikin Heat Pumps that TNB sells comes with a 12 year parts and labour warranty. We are one of Nova Scotia’s exclusive Daikin Comfort Professionals serving Pictou, Antigonish, and Guysborough. Customer service, business integrity, and technical competency are some of the core requirements for becoming and Daiking Comfort Pro. As Daikin Comfort Pro technicians, we are highly trained and continue to educate ourselves to ensure that we are fully qualified to install and maintain your Daikin system. The cost of a heat pump installation can vary depending on the type of heat pump, the model, and the installation requirements. 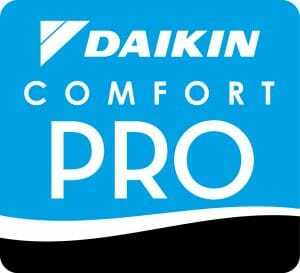 TNB offers free in home assessments by a certified Daikin Comfort Professional. All Daikin Models From TNB Include A 12 Year Parts & Labour Warranty!